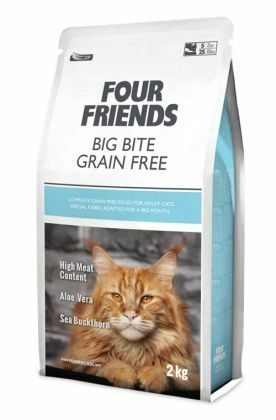 Complete food for large breed adult cats. It is high in natural content of fibre for the prevention and easy flow of hairball. Contain sea buckthorn and aloe vera for excellent urinary tract health. Starting at only £4.00 for a 300g bag, a 2kg bag costs £13.50, a 6kg bag is £33.98 and a bundle of two 6kg bags is only £54.99. FourFriends Adult Big Bite gives excellent value. Remember you earn Loyalty Points on each purchase. dried duck 23 %, dried turkey 18 %, peas, potatoes, chicken fat (preserved with mixed Tocopherols), chicken meat meal 10 %, dried apples, brewer's yeast, hydrolyzed poultry liver, salmon oil (1%), aloe vera (5 g/kg), hydrolyzed crustaceans (a source of glucosamine sulphate) (220 mg/kg), mannan-oligosaccharides (150 mg/kg), chondroitine sulphate (120 mg/kg), fructo-oligosaccharides (100 mg/kg), yucca schidigera extract (80 mg/kg), sea buckthorn (50 mg/kg).